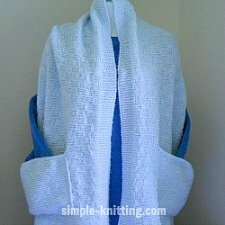 This easy knit shawl pattern is a simple and fun knitting project to make and I created it so that you can use any yarn weight/size. This rectangle shawl pattern is more of a readers wrap or blanket shawl that is great for those chilly evenings or early morning hours when you have just one more row to knit. 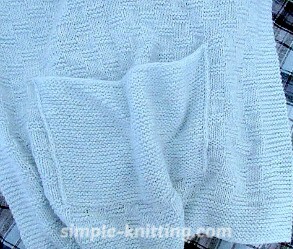 It's also a nice beginner knitting project as well as a nice soothing project for all knitters. You'll have the pattern memorized very quickly so you can watch TV or chat with friends as you knit. And if you choose a thick yarn it can be a quick knit project as a last minute gift idea. I love the versatility of this knit shawl pattern. First of all I want to show you the stitch pattern I chose because it doesn't show up that well on my shawl picture. 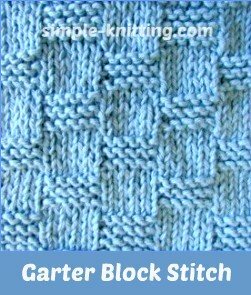 It's called the Garter Block Stitch and is a simple knit-purl check pattern. It's an easy stitch pattern to use and you'll have it memorized after a couple of rows. This will be really nice in a cotton yarn for Spring and Summer. Or you can use a nice thick yarn for the Fall and Winter. While knitting gauge isn't really important for this shawl you'll still need to take a look at your yarn label to see what yarn size/weight it is. You'll also need to know what needle size the label suggests. If you're not sure what to look for please refer to my yarn label page. Find the yarn size on your yarn label, then choose the suggested needle size and cast on the amount of sts your yarn comes closest too down below. Baby Sport weight yarn, cast on 115 sts. Repeat rows 1 – 12 for pattern until work measures approx. 63 inches or the length you prefer. Finish by knitting 20 rows of Garter stitch. Do you want to include pockets? If not then you’re all finished. Yay! After casting on the amount of stitches you need for your pockets and yarn size, knit garter stitch for about 6 inches or length you want. Bind off loosely. My pockets are 3" up from the bottom edge and approximately 5 1/2" in from both sides. Here's a trick to attaching the pocket so it will be straight. You will need contrasting waste yarn and tapestry needle. With your tapestry needle simply baste into the fabric (weaving into every other stitch) all the way around where you want the pocket to be. What you're doing is marking where you need to sew the pocket. Now you can sew the pocket on more easily and it will be straight. Then just remove the waste yarn and you're done. I hope you enjoy this knit shawl pattern. Now you can snuggle up with a nice cup of hot chocolate and enjoy!